Over the past 11 years, BlueBridge Networks has emerged as a state and regional leader in data storage, becoming the first-of-its-kind Ohio-based data center facility with facilities on different national power grids. With data center cloud computing facilities in Cleveland, Mayfield Heights and Columbus, Ohio, BlueBridge has launched data center services, cloud computing and infrastructure solutions across its networks. 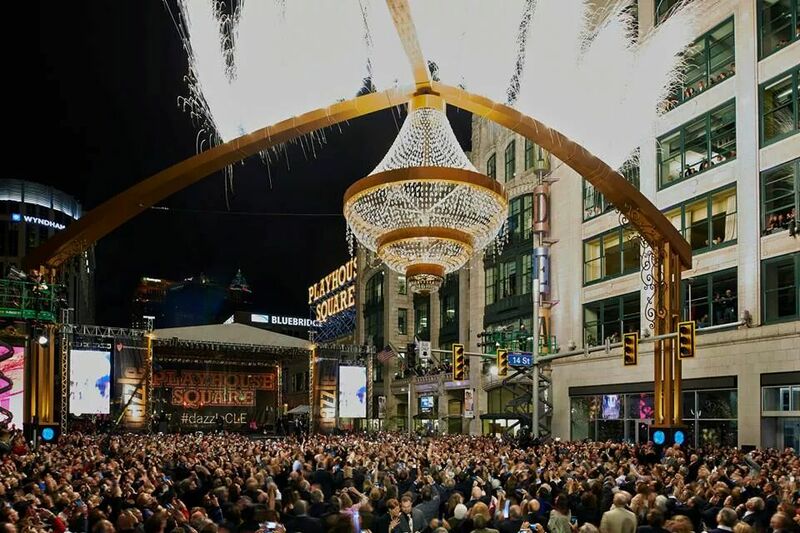 This past December 2014 and January 2015, BlueBridge celebrated its past ten years launching well into its eleventh with a party at its new data center expansion in Cleveland. Today, the company has experienced rapid expansion and boasts big name clients like the Cleveland Museum of Art, which hired BlueBridge to build a cloud-based storage solution that would provide long-term archival preservation of the institution’s digital assets. Other Customers they assist, such as Hyland Software, Brand Muscle, The American Red Cross and Rosetta relies on the company for its variety of services and reliability in hosting their data. Today, BlueBridge is a leader in comprehensive data center services, security and compliance. 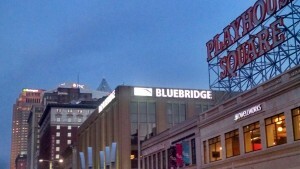 BlueBridge came into existence as a partnership in 2004. The aim was to take advantage of an underutilized asset in the Sterling Building: a newly built $20-million Internet data center facility. The company has continued to effectively reinvest in itself to keep the facility, human resources, certifications, compliance and LEED standards best in class. “One of our unique goals and mission has been to become a total IT solution for our customers, thus reducing costs and improving efficiencies while both attracting and retaining jobs in the region,” explains Goodman. Continued high availability, and security alongside operational excellence are the core values of The BlueBridge data centers. There is no crystal ball as it pertains to the products and services that clients will require in the next 2-5 years and beyond. However the ability to pick up on business cues and technological direction are vitally important. 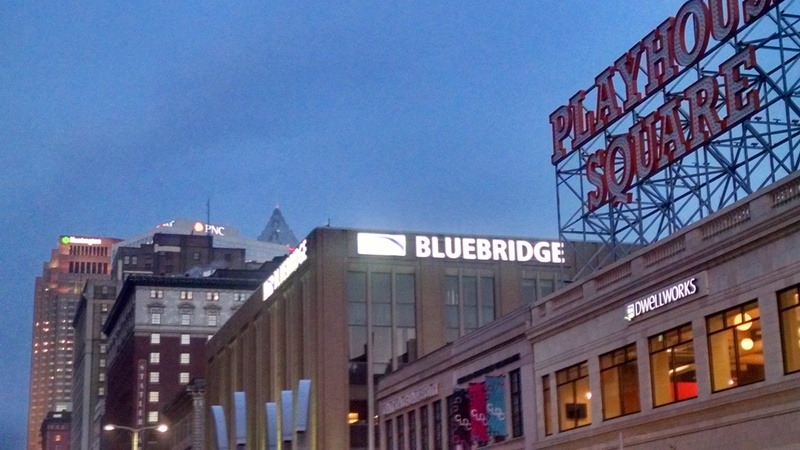 The BlueBridge Cleveland data center Team continues to build out the BlueBridge Cloud Infrastructure in a way that is scalable, secure, reliable and geographically diverse, but most importantly, affordable to the end-client. “It’s easy to spend copious amounts of money in building a rocket-ship to take you to the moon, however it takes talent, determination and foresight to build the appropriate vehicle in an ever-changing technical landscape. We keep the client’s needs in the forefront, and act as trusted advisors. That is indeed the BlueBridge difference”, said Petar Bojovic, Director of Operations and a finalist in the Crain’s Cleveland CIO of the Year Class of 2015. We are beginning to see a trend in which technology practitioners are leading the charge in procuring IT solutions. Selection of data center service and due diligences are in a refreshing direction. In years past, good marketing, as opposed to operational excellence standards, drove revenue. Today, it’s about uptime, high availability, reliability, security and exceptionality. No longer will a data center thrive in a category of over promising and under delivering. In a web and data centric world, data center service providers today are no less a trusted advisors than one’s own attorney, clergy, doctor and accountant. If you are down and out, you will be just that. Our best in class data center facilities are all designed and what is known as an N+1 configuration. In short, this means we work to reduce and eliminate any and all known single points of failure. We have been very conservative in our approach to subscription of resources and stellar and mindful in our preparation for capacity planning. Our focus around operational excellence and policies and procedures are something we live out day to day. It is what allows us to be highly available, reliable and secure. BlueBridge creates and builds on a trusted partnership based on mutual respect and like-minded business strategies. In a web- and data-centric world, BlueBridge is the steward of a company’s lifeblood — its IT infrastructure. In terms of the cloud, BBN invested in and launched multiple platforms which make sense for different levels objectives and size of organizations. Our team is very astute at listening to customers and helping right size IT solutions. Because we design, build, sell and service, we are more focused on what is the best solution for the customer rather than pigeon holing them into a canned solution. We can help companies focused in capex versus opex, as well as those whose focus on outsourcing versus those who want to maintain complete control. BlueBridge’s customer-first approach resonates well with its customers and their IT teams. When the rubber hits the road our team is there for them, whether it’s a need for cabling or a 3 a.m. onsite problem, customers inform us that they recognize that they are not just a number with BlueBridge. We are a big part of what their organization is all about. By working together to solve the issues of a company BlueBridge and its customers form a powerful and highly efficient team. Our fast and knowledgeable team acts as an extension of their staff. We are flexible and nimble. The best way to measure ones successes is by looking at one’s failures. When you look at BlueBridge and their customer retention, it’s not by luck that their customer retention rate is 99%. It is due to the fact that we strive for excellence, both internally and for our customers. We are dedicated and passionate, at times absurdly passionate to our customers and their successes. We are innovative and flexible as it pertains to our approach. We will never treat our customers like hostages nor will we be inflexible in their time of need. Our clients choose us because we make the time. We answer our phones, we return calls promptly and are physically present whenever they need us. We are not just a faceless e-mail address. We know their names and what challenges they face because, quite frankly, we care. BBN expanded to offer its customer base a deeper and wider solution in 2014 and set in up for great poise for growth 2015 and beyond in terms of, not only interconnected floor space and facilities, but has also added products, services and human resources to our portfolio. The end result is consistent and ongoing operational excellence and sustainability. The various expansions have allowed us to reduce cost, improve efficiencies and attract and retain IT jobs and opportunities. Think globally, invest locally. What does this often used phrase mean to BlueBridge Networks, a Cleveland, Ohio-based provider of total technology solutions? It means offering the same world-class data center and disaster recovery services to Cleveland-based entities as it does to businesses and institutions hundreds of miles away. It also means reinvesting in the community so that Northeast Ohio continues to grow as a global leader in education and business with the necessary IT strength and security. In 2014 Mr. Bojovic made it one of his initiatives to add additional Telco’s or Carrier’s to the BlueBridge portfolio. We are a carrier-neutral facility which means the end-customer has the option to use whomever they would like to provide transport and Internet services. During that calendar year, BlueBridge added tw telecom, which has been acquired by Level3 Communications, Agile Networks and OARnet which delivers technology-based solutions that reduce costs, increase productivity and improve customer service. OARnet is a division of the Ohio Board of Regents Ohio Technology Consortium, and serves Ohio’s education, health care, public broadcasting and government communities. Additionally, Security has been in the forefront of the IT landscape. We all know about breaches and cyber-attacks targeting Target, Home Depot, Chase and Sony Pictures. Security is very important to our organization and the customers that we serve. We have partnered with SilverSky, now BAE Systems; SilverSky is a leading independent cloud-based managed security services provider. Their Security-as-a-Service platform delivers cloud-based software and managed services, such as Email Protection Services with advanced Data Loss Prevention, Targeted Attack Protection, Network Security Services, and Managed Application Services, that protects our customer’s critical information simply and cost effectively. By tirelessly safeguarding our customers’ most important information, we enable growth-minded leaders to pursue their business ambitions without security worry. BlueBridge business, revenue growth, customer retention, operational excellence and customer service levels remain at world class standards under Petar’s direction. Many new customers have come on board and revenues are on the rise. American Municipal Power chose BlueBridge Networks, being a leading provider of data storage management and disaster recovery services. This means adapting to the specific needs of each customer. When it came to providing services for American Municipal Power (AMP), a Columbus-based nonprofit, wholesale power supplier and services provider for 131 member municipal electric systems in seven states, the goal was to offer risk mitigation with disparate power grids in Cleveland and Columbus as well as a network operations center at BlueBridge’s Cleveland facility. Digging deeper, the BlueBridge-AMP connection creates a trusted partnership based on mutual respect and like-minded business strategies. “In a web- and data-centric world, BlueBridge is the steward of a company’s lifeblood — its IT infrastructure,” says Kevin Goodman, managing director and partner, BlueBridge Networks. “We want our IT focus to be on the core capabilities that are strategic to our business,” explains Branndon Kelley, VP, IT and CIO of AMP. “Data storage and recovery are important, but not strategic to our business. When it comes to an operations center, 24-hour monitoring and disaster recovery, we wanted to let experts handle those so we can focus on bringing the highest value to our members.” With BlueBridge concentrating on non-strategic IT and data services, the IT team at AMP can now place all of its emphasis on meeting its members’ power needs. By working together to solve the issues of a company providing power to 131 members, BlueBridge and AMP form a powerful and highly efficient team. “Our fast and knowledgeable team acts as an extension of the AMP staff,” Goodman says. “Poised for the next ten years and beyond, BlueBridge continues to invest in the state—one that should be known by its infrastructure in a fast-paced technological world. The work undertaken by BlueBridge contributes to the overall competitiveness and well-being of not just the cities of Cleveland and Columbus, but a significant portion of Ohio and beyond. We have moved from pioneer to innovator,” said Goodman. To that end, BlueBridge Networks, has been and will continue to be a committed partner in bringing regional and Ohio businesses to the global marketplace. BlueBridge and other technology companies can efficiently and effectively move forward and compete as champions and ground breaking companies in the global marketplace while improving the quality of connectivity , opportunity and life in our region and world. This entry was posted in Cloud Computing, Data Center, Operational Excellence and tagged cloud, data center, operational excellence, security, team building, technology. Bookmark the permalink.